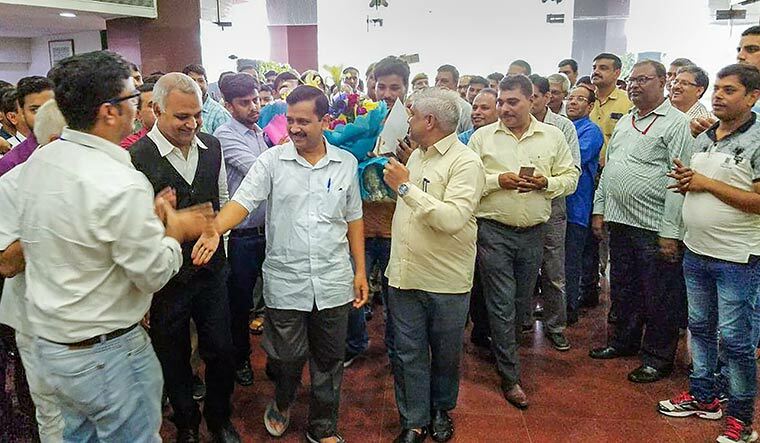 ON JULY 6, two days after the Supreme Court passed its order delineating the powers of the lieutenant governor and the elected government in Delhi, Chief Minister Arvind Kejriwal plunged himself into hectic stocktaking of the living conditions in unauthorised colonies in the capital. Visiting the slums, which house the Aam Aadmi Party’s core vote base, Kejriwal was his characteristic humble self as he asked people about their problems. But, his angry avatar was on display as he took officials to task, threatening to suspend them if they did not perform. Kejriwal’s real target, however, was Lt Governor Anil Baijal and, through him, the Modi government at the Centre. His message to the slum dwellers was that, thanks the Supreme Court’s order, his government could now undertake development work in those areas on an immediate basis. Implicit was the charge that Baijal, acting on the Union government’s orders, was trying to throw a spanner in the AAP government’s good works. The chief minister’s resolve was apparent as the Delhi government wasted no time after the court order to go on a scheme-clearing spree. Among those cleared was the AAP government’s pet project to provide doorstep delivery of rations. Kejriwal cleared the project, overruling Baijal’s objections. The AAP government tried to convey that, following the Supreme Court verdict, it was the real power centre in Delhi, except on matters of law and order, and of land. Not surprisingly, the first post-verdict order of the Kejriwal government dealt with claiming control over appointments and transfers of officials, which has been the biggest reason for its clash with Baijal. In its verdict, the Supreme Court stated that the lieutenant governor could not take decisions independently, and had to act on the basis of the aid and advice of the cabinet. It clarified that only three areas fell under the jurisdiction of the lieutenant governor—the police, law and order, and land—and that the elected government held sway over all other domains. The verdict states that decisions of the council of ministers do not need the concurrence of the lieutenant governor. But, if there is a disagreement between the parties on any issue, the lieutenant governor can refer the matter to the president of India, whose decision would be binding. The Delhi government may feel unshackled from the restrictions imposed by the Centre’s May 2015 notification, which said the lieutenant governor is the final authority in Delhi, and the August 2016 order of the Delhi High Court, which concurred with the notification. In reality, though, the elected government and the lieutenant governor may still be on an equal footing. The judgment has failed to end the confrontation between the Kejriwal government and the Centre. The two sides have contrasting interpretations of the order on who has the power of appointments and transfers in Delhi. When Kejriwal called on him following the court’s order, Baijal did not agree that the order meant that the services department was now under the Delhi government. The AAP argues that the May 2015 notification of the Union home ministry stands annulled after the judgment. “When the Supreme Court has conclusively ruled that, apart from land, the police and public order, the executive power of all other subjects lies with the elected Delhi government, why are the Union home ministry and the Delhi LG trying to mislead the public?”asked AAP leader Saurabh Bhardwaj. The Centre’s advice to Baijal, however, is that since the Supreme Court has clearly ordered that the matter of services be placed before the appropriate regular bench, it would be against the law to take a final view on it. Kejriwal’s detractors say that he has actually been chastised by the Supreme Court. According to them, he has been called out for using disputes with the Centre as a political tool, and has to now act responsibly and work according to rules. “If the AAP government goes by the book, then it does not need the LG’s approval on every issue. But if they try to circumvent the laws and are dictatorial, the LG, as protector of the Constitution, will have to step in,”said Manoj Tiwari, president of the BJP’s Delhi unit.